You can send any serious questions about PHP-GTK to php-gtk-dev@lists.php.net, but the questions about PHP-GTK MANUAL should be sent to php-gtk-doc@lists.php.net. If you have any question or suggestion for our website you can send them to php-gtk-webmaster@lists.php.net. Thank you! The PHP-GTK was established in March 2001 by Andrei Zmievski an uzbek who lives and works in the United States. 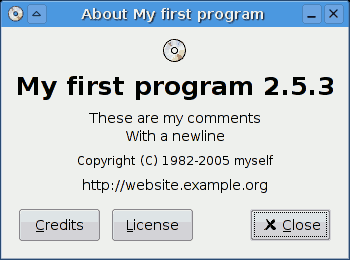 As well as many projects in free software, it also started with an initial motivation a little peculiar, "I did it because I wanted to see if it was possible" in the author’s words who inspired so much in another existing project, the PyGTK (link between languages ​​between Python and GTK). Andrei Zmievski visited Brazil in 2002, during the III International Free Software Forum, which made some presentations. The PHP-GTK is a "language binding", ie it is a link between two existing languages, PHP language and GTK library. So PHP-GTK is the PHP itself, with more features. The PHP-GTK is the first extension of the PHP language that lets you write client-side applications with GUI (Graphical User Interface). It was written in part to prove that PHP is a language and full of great purposes. The junction between PHP and GTK tool creates an independent platform that runs on both Linux and Windows environments. Using PHP-GTK, you create an application that has connectivity to the server (database, access to files, etc. ), like all other programs written in PHP, but that because of running on the client machine, also has full access to resources of this (run applications, write local files and access devices). For this purpose, PHP-GTK needs to be installed on each client machine that will run a PHP-GTK application. Source: http://www.php-gtk.com.br/home. If you have problems or questions, your first point of contact should be the manual and the php-gtk-general mailing list. Copyright © 2001-2016 PHP-GTK Team. All rights reserved.